"The kingdom of heaven is like a treasure hidden in a field. One day a man found the treasure. The man was very happy to find the treasure. He hid the treasure in the field again. The man went and sold everything that he owned to buy that field." Some things are so precious that we cannot find them; they find us. 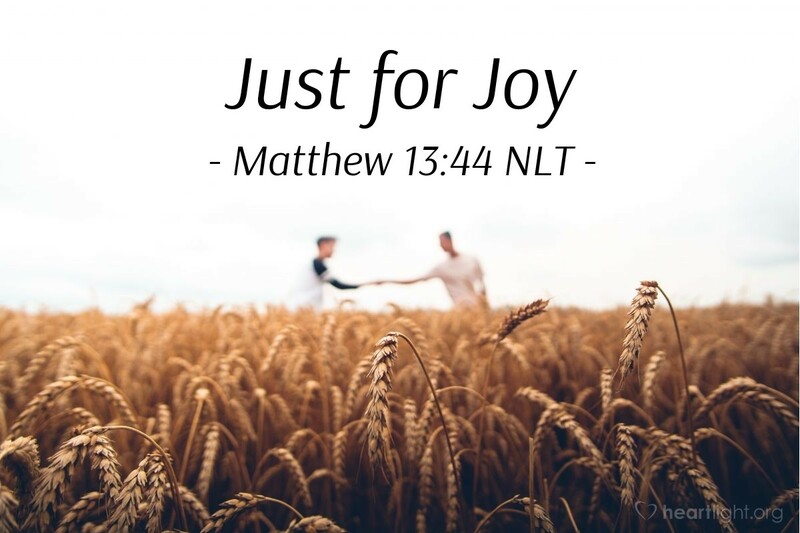 While we may not have been looking for salvation—either because we grew up around it in our families or because a friend or acquaintance shared it with us—that does not lessen the fact that when we understood its glory, we gave up everything for the sheer joy of being included in God's Kingdom by his grace. Grace motivates with joy. While I may know I surrender to the Lordship of Christ and the rule of his Kingdom because he is worthy, my sense of joy at being included in the Kingdom and adopted into the family so far outruns obligation that I forget it is a difficult challenge to follow. Holy and kind Father, thank you for bringing me into your Kingdom. I know that my salvation, my being a part of your family, is the work of your grace and sacrifice. Thank you for making me yours. Through your Spirit, reawaken my joy of salvation each day. In Jesus' name I pray. Amen.